It's hard to deny how influential Migos has become but you're certainly welcome to try. In an era where we are being told "music doesn't sell" and that "streaming is the future," we've seen "Culture" be certified platinum. That means over one million "units" have been sold, although to be fair the definition of a "unit" has become more mutable given it now includes digital spins. Even if you were to slice the pie in half, that's still an impressive number of hard copies -- even a third or a quarter of the pie would be. "Pie" is apt given there seems to be an insatiable appetite for the stylings of Quavo, Takeoff and Offset. Fans want to skip dinner and go right to dessert. Even as legal problems continue to chase the group, the #MigosNation chases right along with the law, putting them in high demand for every concert tour and music festival. If you can afford their price, book Migos for your show and watch those tickest GO. 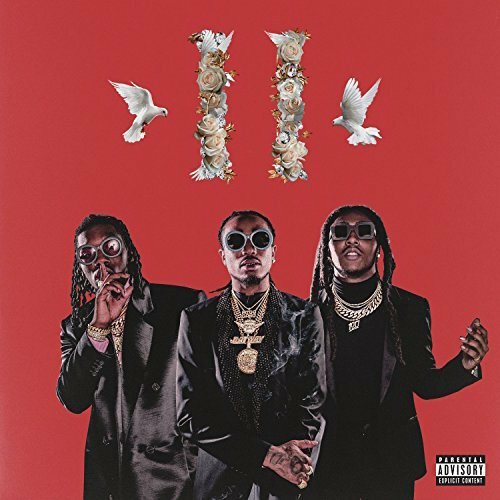 Not willing to slow down their momentum any time soon, Migos took a page from the playbook of other commercially successful rappers like E-40, Nelly, Nas and the late Tupac Shakur among others and made their follow-up "Culture II" a double album. That's only the beginning though. If you've seen Cardi B on the recent "Alexa Has a Cold" commercial from the big game and thought her voice sounded familiar, you either knew her hit single "Bartier Cardi" or her cameo on "MotorSport" side by side with the Nicki Minaj, sounding (and looking) like her protege as a pair of "bad b--tches" taking over rap. The music video has done what once would have been an astonishing 175 million views, but lately is becoming the norm for superstars like the Migos crew. "MotorSport" hails from disc two of the double album while the second single "Stir Fry" hails from the first disc. Even though the first one might be the bigger track due to the guest stars, I must admit my preference for the second based on an infectious Pharrell Williams beat which sounds like a cross between an 808 and a marching band. Like many of their songs it's a direct reference to being illegal entrepeneurs, "whipping up" something sold in small vials, but this song is definitely more about the sound than the lyrical content. Life's Monopoly, go cop me some land and some property (property)"
By the way if you didn't know Patek makes some VERY expensive watches, but with the money Migos is making they can no doubt afford a few. Appropriately enough the very next song on disc one is the Zaytoven produced "Too Much Jewelry," another case of sound and style over substance. The real title should be "never too much jewelry, I'm serious" as they brag about spending and "trending" while their "diamonds drawing attention." It's the height of conspicuous consumption and the depth of narcissistic vanity. Criticizing it seems redundant though since I've said what Migos is all about before. It's not problematic as long as they make music that's fun to sing along and drive around to. Few mainstream acts (and Migos certainly are that at this point) do it better than they do. Historically speaking rap artists or groups who release double albums end up having a lot of filler material just to reach that threshold, leaving the consumer feeling like a single disc with the best of both albums would have been a better value. I wouldn't go so far as to say "Culture II" doesn't have filler, but it's either less than the average or I'm becoming more of a fan of their AutoTuned stylings. They've reached a point of stardom where cameos by other famous rappers aren't necessary any more, yet still do back to back dope tracks with Post Malone and 2 Chainz on "Notice Me" and "Too Playa" anyway on disc two. The same thing almost happens on disc one but "Auto Pilot" ends up being an enjoyable minimalistic echo chamber that falls between "Bad B---hes Only" featuring 21 Savage and "Walk It Talk It" featuring Drake. Production benefits Migos more than most rap acts out today. Metro Boomin and Mike Dean can turn even a throw away track like "Emoji a Chain" into something not to skip over. Murda Beatz and The Arcade do even better on the hypnotic "Gang Gang." I'd actually choose it for a single but I don't know if that's in Migos' plans. If not that I'd go with the Cassius Jay and Nonstop da Hitman laced "Made Men," which combines a simple drum tap with a smooth backdrop that I'm kicking myself for not being able to place (and WhoSampled was sadly no help). I've been reading and hearing some people say that "Culture II" flopped which I find a bit absurd given it only came a couple of weeks ago. That's hardly long enough to judge whether or not it will achieve the same heights the first "Culture" album did. It is an ambitious double disc clocking in at over 100 minutes, and if you're not a fan of their wavy flows and braggadocious lyrics then that's probably 90% too much for you. I'd be lying if I said it didn't occasionally prove to be too much for me as well. There's too much material here to sit and listen to straight through in one sitting. Give it time though and "Culture II" will grow on you - I find a new song or two I enjoy each time I go through this extensive playlist.